Sales Director and keen cyclist Daniel Osen has launched a new pothole repair product in the UK as a direct result of encountering so many dangerous holes in the road while enjoying his hobby of cycling. RonaRoad EcoPatch pothole repair can be laid at temperatures down as low as -20°C and is greener and more effective than other pothole repair products on the market. 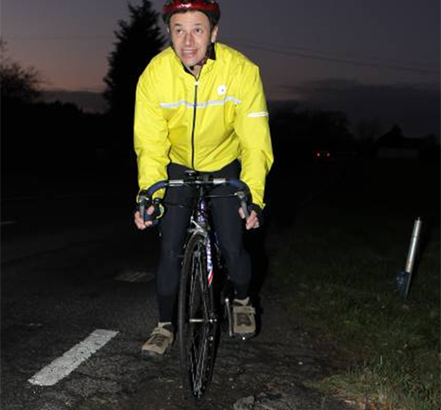 Daniel, Sales Director of chemical construction products manufacturer Ronacrete, enjoys cycling so much that he cycled the length of the UK for his 40th birthday. He now plans to cycle from the east to the west coast of America. However, whilst training for his American journey Daniel noticed a marked deterioration in the road surfaces. The combination of construction product salesman and cyclist in Daniel led him to make some investigations into pothole repair; he particularly wanted to find out why the repairs so often failed, with holes reappearing months or weeks later. The Ronacrete technical team started researching the pothole repair market, talking to manufacturers, road-repair contractors, and to local authorities. It was discovered that many traditional pothole repair products use solvents to make them soft enough to use. However, these solvents, which are based on petrol, diesel and benzene, actually make the product fail early. They are also not good for the environment as they can leach into the road contaminating streams and rivers. After more research Ronacrete launched a new road repair product which addressed both these issues - RonaRoad EcoPatch. Unlike other pothole repair products RonaRoad EcoPatch doesnt contain damaging petrol solvents, but instead has a softener using biodegradable plant extracts. This has two distinct benefits. First the environmentally friendly softener prolongs the life of the repair, as toxic solvents can attack and eat away at the other components in the products weakening the bond from the moment they are applied, (one of the main reasons that holes reappear). Secondly because RonaRoad EcoPatch doesnt contain the toxic softeners it is friendlier to the environment than other repair products. The third unusual benefit of RonaRoad EcoPatch is that it can be laid at temperatures as low as -20°C remaining pliable in extremely cold weather. This is important because potholes appear as a result of water trickling into small holes in the road surface and then expanding when the water freezes causing the surface to break away. So potholes need to be repaired in cold weather because that is when they appear.